Gr8 Article…. Basically Divide and Conquer.. The fastest way to do anything is to avoid the overheads. Can storage indexes be made on composite keys ? Storage Indexes can be used in combination with each other such that a storage region can be avoided if an column 1 can’t possibly be there or column 2 can’t possibly be there as in the case with AND based predicates where both columns values must be true. I’ll show some actual examples of this in future posts. Incase the SI has flag ‘Y’ for a given column and range , in all the scattered range(s) then it might end up reading all data. Basically not possible to filter out data which has not null value when only looking for NULLS ! Why not to keep NULLS separate. Index with Null is always messy !! This will work best with Number & Date Datatype. With Varchar2 Datatype say on column first_name, how to define range ? Thats cool !! Thanks for the post Richard. Hello Richard, than you very much for the insights. I have some questions. You said ” Storage Indexes take up no physical storage of themselves and are built and maintained entirely in memory. ” That means after each startup of the instance, the SI (storage Index) need to be re-calculated? And it is a data distribution pattern, it must read the whole database again and again just after each instance re-start? In which memory area SI is stored? What is the approximate size of the SI for 1MB data? Thanks a lot again for giving insights of SI. 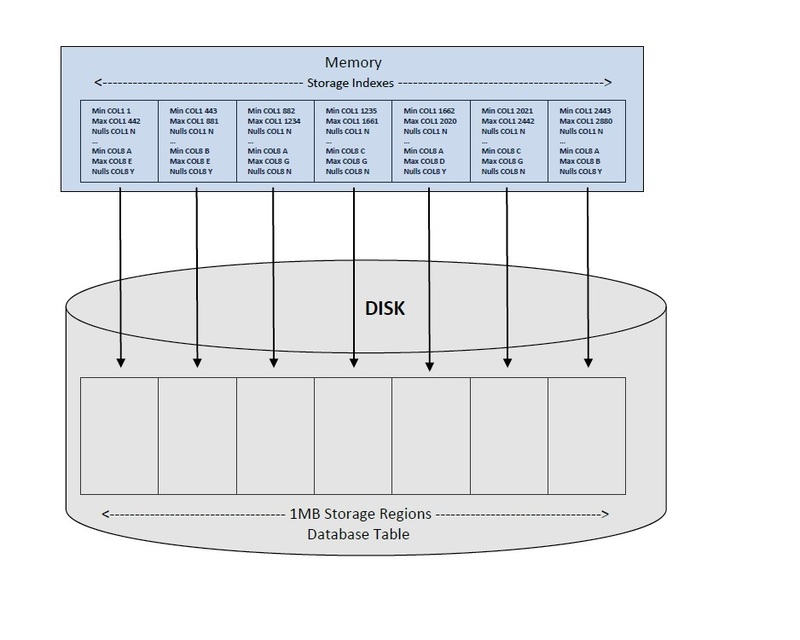 Storage Indexes are created in the memory of the storage servers, not the database SGA. Therefore, it’s not the startup of the database instance but of the storage server that would require the SIs associated with the storage server to be re-created. So in may well be for a specific table that some portions of the SI may not be currently created (this can occur for a number of reasons). Note though that as there’s no physical object to create, re-creating a SI is nowhere as costly as a corresponding physical database index. The approx size of a SI for a 1MB storage region depends on the size of the indexed column but it’s relatively tiny as it just needs to basically store 2 values (the min and max values of the column) and a null flag. Compare this to a database index which basically needs to store all the indexed values within a 1MB of table data, plus all their corresponding rowids plus overheads. My next post will be on the differences between SI and Database indexes and will cover some of these topics. Yes, the clustering of data can be an important determination on the usefulness of a storage index. I’ll cover this later. The null flag makes it possible for Oracle to ingore whole regions of data if nulls are not particularly common. It’s usefulness of course will depend ..
Varchar2 columns work in exactly the same way, the min/max is stored and compared. If the ranges are wide and ellimination not particularly effective, then it might not end up being created and being one of the “lucky 8”. 1. How can we view information on the storage indexes that exist at a point in time. 2. How frequently are the storage indexes update. IE Do they get updated fro every insert and update. 3. Is there any performance overhead on DML activities when we are using storage indexes.